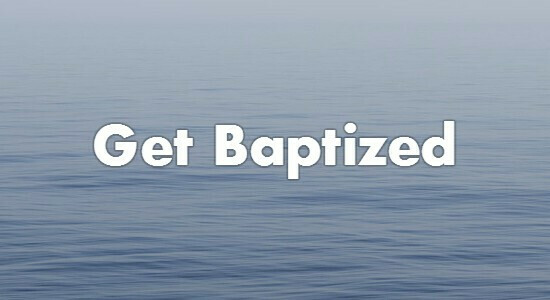 The word baptism simply means to “dip” or “immerse” something under water. When the writers of Scripture used that word to refer to the religious act that we now think of, it meant to immerse individuals under water. In the Great Commission, Jesus commanded his disciples to go out into the world and make disciples of all the nations by baptizing them and teaching them all that he had commanded. But that raises the question, “Why is plunging people under water such a big deal?” The answer is simple: It depicts the greatest news that anyone could ever hear. You see, the Bible tells us that we are all sinners (Romans 3:23) who cannot save ourselves from the just punishment that we deserve from God. And in order to rescue us from the penalty of sin, God the Father sent his Son Jesus to earth to live sinlessly, die sacrificially on the cross in our place for our sins, and rise again on the third day. When someone turns to Christ in repentance and faith, the Bible says something amazing happens. They die to their old sinful self and they are raised to new, spiritual life in Christ. The old person passes away and a new person is made. They are new creations with a new heart. Baptism is a picture; a symbol. It is an outward picture of the inward reality of what happens when a lost sinner turns to Christ in repentance and faith. When the new convert is dipped down into the water, it symbolizes his death to sin and his burial with Christ. When he is raised from the watery grave, it symbolizes his new life in Christ in which he will walk and live. It symbolizes the union and unity that we have with Christ. Because the Bible speaks of baptism in these terms, baptism should only be given to those who are professing faith in Christ. In other words, this understanding of Baptism distinguishes us from our Presbyterian and Methodist friends who baptize infants. When a new believer is baptized, it is a public testimony and proclamation of his faith. It is an invitation for the church to walk with the new believer in his or her new spiritual journey. And it is a public display of God's kindness in Jesus Christ. Some might ask the question, “Is baptism necessary?” The answer is “yes!” It is necessary as an act of obedience to the Lord Jesus Christ. Obedience in the Christian life is not an option. However, it is not necessary in order for one to be born again. It is not a pre-requisite for entrance into the Kingdom of God, because we are saved by grace through faith and not of works (Eph. 2:8-10). The pastors at CHBC are absolutely committed to shepherding you and your family carefully. That can be tricky, especially whenever a young child professes faith in Christ. Children, whose hearts are so malleable, want badly to be affirmed by their parents and their pastors. They often go to great extremes to please mom and dad. That’s why for we have a class for young children who have made a profession of faith. It helps us make sure they understand the gospel and are sincere in their profession. Often baptize the child soon after taking the class and meeting with a pastor, sometimes we suggest that parents take some time to watch and shepherd the child as they grow to understand the gospel better. Either way we rejoice that the Lord is at work in their lives. Contact a pastor and we’d love to hear your story and talk about when baptism would be appropriate!